If a picture is worth a thousand words, then a video is priceless. It is exactly what keeps the multi-billion dollar TV and video revenue growing faster by the minute. And although you may not be the next rising star, we know just how to get your feet wet and grow your following. 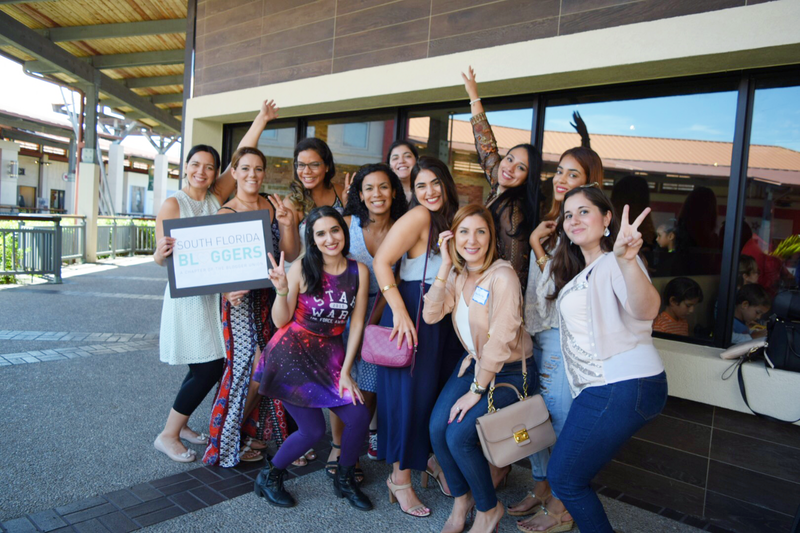 Our September meetup with the South Florida Bloggers was all about Snapchat. Some may see it as the modern-day “Dear Diary,” where all is documented and exposed live for 24 hours. But we are about to catch you up with two of Miami’s local Snapchat influencers, Jose Resendez and Amanda Taylor, who joined us at Los Ranchos Steakhouse at The Falls for an afternoon of meaty content. Jose and Amanda agree that one of the first things a newbie to Snapchat must know is that you have to make it a habit of being active on your account. The more you snap, the more you get a hang of it. Here is what a seasoned “Snapchatter” might be doing: selfie-mode 24/7. Break the ice, as Amanda says, and push through that stage so that your followers get to know you so much better. It is fine to snap a coffee mug here and there, but the bottom line is people want to see your life. When you are starting out, it is also a good idea to get to know your audience. They are watching you after all, so might as well follow back and see what is on the other side. Figure out your following because as Jose mentioned, it gives you a sense of what gets them tuning in. Pro-tip from Amanda is that you can view how many people screenshot your snaps and that also tells you what your viewers like. You might be juggling multiple social media accounts all at the same time. So why make Snapchat a priority? Well, as Jose and Amanda see it, potential clients happen to really like it. To answer your next question, yes, you can take a few extra steps to drive your current following on other outlets to your Snapchat. One suggestion from Jose is that you print your snap code on your business card. Make sure it works and then you can start reaching new peeps! Also, Amanda notes that you can have your snap code handy by saving it on your camera role. Then you can post it to other platforms — such as Instagram — and get them to check out fresh content on Snapchat first. Why give them first dibs? Well, turns out Snapchat is (technically) undiscoverable. In plain English… a follower on Snapchat really went out of their way to find you, so they really, really like you! And if you are keeping score, so is Snapchat. There is no count of your followers, unless you sit there and count them individually, but Snapchat does give you the sum of your engagement. It goes something like: Snaps posted + Snaps returned. Your content also gets views, which keep adding up through the next 24 hours. This count might be very useful with clients because you can report back how many viewers your content reached. What if a brand wants to work with you for compensation? Amanda suggests that you keep it real. Your followers can pretty much tell if you are sharing an ad, so you might as well tell them. People appreciate honesty and it pays—pun intended—to give them a disclaimer. Throw in some language for your sponsors. Jose finds it helps to tell your followers that the next few snaps are related to a compensated campaign — save yourself from repeating it every time. After some more Q&A, bloggers enjoyed bites from Los Ranchos Steakhouse. The first sampler plate was a variety of delicious treats like quesadillas, fried cheese cubes, and fried plantain chips. Everyone was then served a mixed plate with chicken and chimichurri-marinated steak strips, rice and plantains. Their signature “Tres Leches” dessert was the perfect close to satisfy our sweet tooth and was also enjoyed with a hot cup of coffee. Join the South Florida Bloggers today to find out more about next month’s meetup! Cuban native with a flare for foodie finds. Chances are you will catch me talking about my latest adventures with food. I learned something by reading this post! Thanks!! I try to stay active on my snapchat account. It always surprises me that people actually watch my stuff. I don’t feel like it’s very interesting most days. I will say, I love getting a peek at how eveyone else’s day is going through snapchat. That’s what keeps me a regular user. Join The South Florida Bloggers Facebook Group! Add this badge to your site & support South Florida Bloggers! Chapter Officer: Paola Mendez Hi! My name is Paola and I am the Founder of The Blogger Union. I believe that if we all work together we will all grow together! I help Blogger Union Members continue to improve as bloggers. If you have any questions, suggestions or ideas please let me know. I definitely want to hear from you! We can do this together. Oh, I also run the sites Coral Gables Love + Dapper Animals. Chapter Officer: Mei Jorge is the driving force behind the bilingual style and travel blog, Blame it on Mei, Her passion with fashion dates back to her childhood’s surroundings in the tropical island of Cuba. Through her feminine, classic and chic style she inspires women to dress and feel better about themselves no matter the price tag, age, lifestyle or personal circumstances. Mei loves traveling, as much as the latest trends; she has visited over 20 countries and is always in search of her next adventure —but never sacrificing style. Chapter Officer: Nabila Verushka Nabila Verushka is a freelance photographer who one day decided to make the blog One Tiny Dinosaur, about all the geek chic fashions she wears. When she’s not photographing people, weddings, engagements, birthdays, and other events; she likes to photograph and write about her geeky lifestyle, action figures in the wild, and her abuelita’s garden, amongst other things. She’s currently studying Business Administration at FIU and will be graduating next year. Wendy runs the bilingual lifestyle and food blog, Your Helpful Foodie. She helps people find places to eat, events to attend, and tips to follow. Wendy is also an Elite Yelper with over 1,000 reviews who enjoys sharing her adventures with her followers. © 2018 The Blogger Union, Inc. All rights reserved.